I took this photo on the road to the Meteor Crater Natural Landmark complex the first time I tried to visit in 2015. 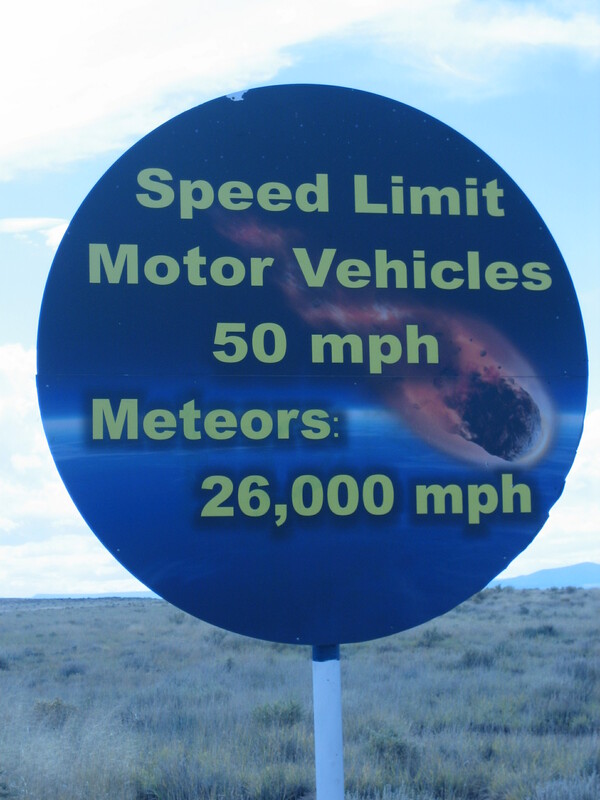 I’d planned to visit Meteor Crater Natural Landmark once before. I’d taken exit 233 and driven nearly 6 miles to the parking lot. I’d even gone into the visitor center, but when I saw the price of admission, I turned around and left. I’d budgeted $10 to see this roadside attraction. I probably would have splurged and spent $12, but when I saw the price of admission was $18, I went back to my van and got back on the road. I doubted looking at a crater would be worth $18. The Lady of the House thought this story was hilarious. He just kept talking about how big it was, The Lady said of her son after his visit to Meteor Crater Natural Landmark. The crater wasn’t originally on our trip itinerary. We hadn’t planned to be on I-40 at all, but waiting for my van’s water pump to be replaced delayed us by four days. We cut the New Mexico portion of our trip out entirely, which meant we had to get to Utah by a different route. Since we’d be on I-40, The Lady really wanted to see the meteor crater. You pay the $10 you budgeted when you stopped before, The Lady told me, and I’ll pay the $8 difference. I told her it was a deal. The Meteor Crater website said guided tours were available. I called the Meteor Crater office and found out the guided tours were included in the price of admission. I always like to take a guided tour if it doesn’t cost extra. I find I learn more from a tour guide than I do if I’m left to my own devices reading informational placards. The night before our visit to the crater, we boondocked off I-40 between Flagstaff and Winslow, just outside Walnut Canyon National Monument. We’d hoped to arrive at the crater in time for the first tour at 9:15 in the morning, but we were running late. In retrospect, we were glad we’d missed the first tour because when we arrived, we still had time to use the (clean) restroom, buy a few souvenirs in the (well-lit, neatly arranged, not overpriced) gift shop, and watch the (entertaining, informative) short documentary IMPACT! The Mystery of Meteor Crater. 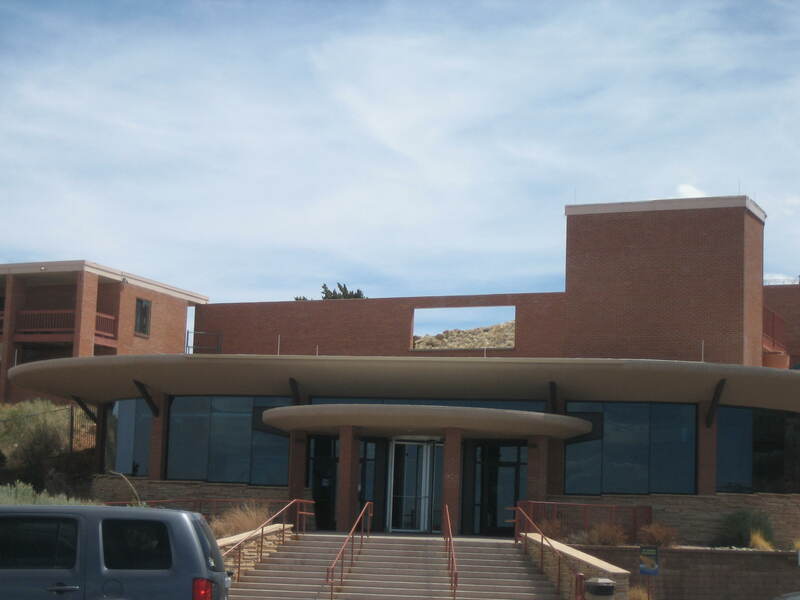 This photo shows the entrance to the Meteor Crater Natural Landmark complex. Before we did any of those things, we had to pay the admission fee. The worker who greeted us at the door was all smiles. She welcomed us and pointed to the sign above the box office where she said we’d see the prices listed. We already knew the prices (they’re on the internet, as The Lady said to me later, thus a matter of public record), so when The Lady walked up to the box office, she chirped Two, please! and didn’t balk when the ticket seller asked for $36. A young couple walked in right behind us. I’d noticed them in the parking lot. They looked like neo-hippies, or at least the man did. He had long hair and a big beard and wore baggie pants that probably allowed him to do the sun salutation in the morning and wrap his legs around a djembe at the drum circle at night. The woman looked less like a hippie and more like a Whole Foods athletic urbanite in a tank top and those hiking leggings that are in fashion with women who engage in outdoor sports. The fellow was talking to the greeter. I wasn’t following their conversation, but I heard the fellow say $18? in surprise. He lady friend echoed $18? in pure disbelief. I thought it was really funny that the couple was having the same reaction I’d had during my first brief visit. The greeter must have confirmed the $18 admission fee. Then the fellow seemed to be asking if there were a place they could look at the crater for free; I’d had that same thought during my first visit. The greeter must have told them there was no free viewing because the couple left the building. The Lady and I, however, went deeper into the building. Then we went out a door, up some steps, past the under-construction Astronaut Park, and into another door. We were now in the area housing the Discovery Center, the restrooms, the Subway restaurant, the gift shop, and the theater. 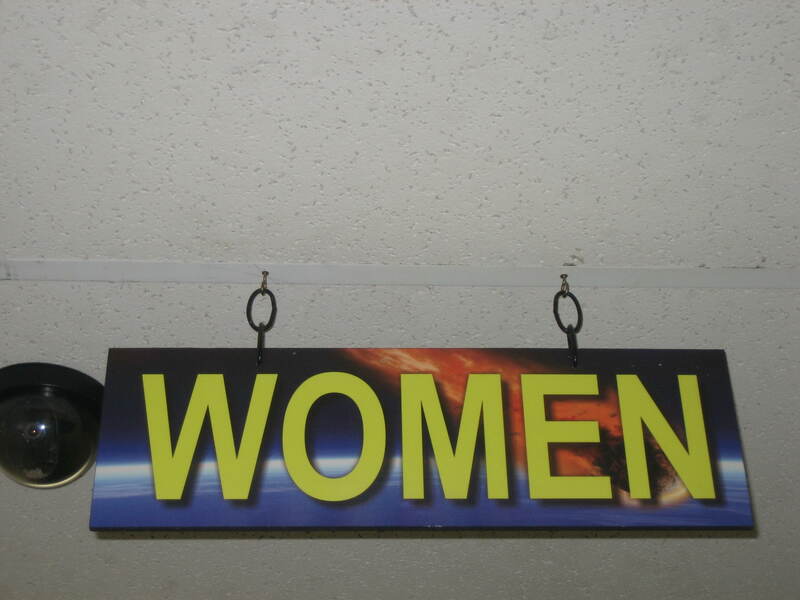 I guess they wanted to get their money’s worth on that graphic, The Lady said.It was on everything from road signs to restroom signs. Second stop: Gift shop where I bought postcards and The Lady bought The Boy a souvenir t-shirt to replace the one he’d bought during his visit and outgrown. Third stop: Theater where we watched the informative short documentary IMPACT! The Mystery of Meteor Crater. After the movie was over, it was time for a tour. We fell in with Jake, our tour guide, who took us right out to the edge of the meteor crater. I was glad we’d opted for the tour because visitors don’t get nearly as close without a guide. I was glad the weather was good too because tours are cancelled due to bad weather, including high wind speeds. I was also glad The Lady and I were visiting in spring because in the hot Arizona summer the tours are cut short. While visitors can see the crater from the observation area (including through a big glass window for the days it’s too hot and/or too windy to go outside) and can get close-up looks through the free telescope views, no one goes out to the edge of the crater without a guide. I’m sure it would be a huge liability issue to have people standing so close to the edge and perhaps trying to climb down into the crater. The people who own the crater (yes, it’s privately owned) must feel safer having a guide keep an eye on people who go where there are no barriers. We walked out on a short paved path, and there it was to our left—Meteor Crater. The Boy was right; it was big. Other words that came to mind when I saw the crater were huge, massive, immense, and fantastic, yet it’s difficult to put into words or even capture in photographs just how stupendous the crater really is. We learned from the movie that the floor of the crater is large enough to house 20 football games being played at the same time, while the sloping sides of the crater could accommodate stands big enough to seat 2 million fans. That’s difficult to imagine, even while I was standing right there looking at the crater. I didn’t quite begin to understand how big the crater is until I looked through one of the observation telescopes. Looking through the telescope, I could see the floor of the crater where a 6’ tall (I later read) cutout of an astronaut stood in front of a chain link fence. The cutout and the fence both looked itty bitty, even through the telescope. the floor of the crater is 550 feet deep, equivalent to a 60 story building. The crater is over 4,000 feet across and 2.4 miles in circumference. The Lady dances with (a cardboard cutout of) an astronaut in the Discovery Center. created the crater and the process by which the theory that the crater was made by a meteor (not a volcano as originally thought) was proven. The Lady really enjoyed the second stop on our tour—The Rock Table—where Jake did a show-n-tell of how the meteor impacted (my pun—totally intended) the geology of the area surrounding the crater. information about meteors and space. There were interactive exhibits, like the one letting the visitor lift an earth rock and comparably sized piece of a meteorite to show the difference in their weights. The Discovery Center seemed to do a good job explaining scientific information in ways kids could understand, while still keeping the exhibits interesting for adults. I wasn’t so excited about the Discovery Center that day after being out in the sun and the wind during our tour, and knowing I still had hours of driving ahead of me, we kept our visit short. However, the Center must be very popular on days when it’s too windy to go outside or during the summer when the heat cuts the tours short. You’re probably wondering if the entire experience is worth the $18 admission fee. Folks do get a lot for the price of admission, including the guided tour, the opportunity to view the movie, free use of the telescopic viewers, and access to the Discovery Center. Once you’re in, you’re not nickeled and dimed to death. Also, visitors are allowed to bring in water and snacks, or get their hands stamps for reentry and go out to their vehicles to eat and drink. Every part of the operation The Lady and I saw was clean and well-maintained, so no one is slacking on maintenance in order to line pockets. Finally, all of the employees I encountered (including the clerks in the gift shop) were friendly and seemed happy, so I suspect the workers are being paid decent wages. I’m always happy when workers are earning decent money. So while I can’t say an $18 admission fee is in my budget, I do think the people who pay that amount get good value for their money. For folks interested in space and heavenly bodies in general and meteors and the impact they’ve had on earth in particular, as well as those interested in geology and the history of the earth, Meteor Crater Natural Landmark would be a very interesting attraction. I’m glad I went, and I appreciate The Lady subsidizing my admission fee, but I wouldn’t encourage travelers on tight budgets to give up something else to visit here unless they were huge fans of meteors and the craters they leave behind. This photo does no justice to how deep and wide Meteor Crater really is.